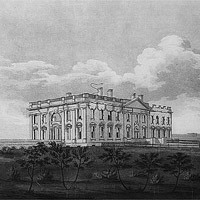 Constructed of white-gray sandstone, the presidential mansion was called the White House as early as 1812. President Theodore Roosevelt officially adopted the term in 1901. Over the years, the original building has been expanded, reinforced, set on fire, and rebuilt.